Lead acid jump starters are conventional tools of the trade for jump starting vehicles of all sizes. As they are a little bulky, they are not exactly the perfect solution for general motorists and are usually the preferred tool of motoring professionals, such as car salesmen and motoring engineers and technicians. For general motoring lithium ion jump starters are more applicable as they are far smaller and easier to handle. To be prepared for unexpected emergencies, see our emergency jump starter guidance for the best options. One advantage of lead acid jump starters have over lithium ion jump starters is that they can have air compressors built in. This means that ONE product can save you from BOTH of the major reasons for roadside recovery call outs – defective batteries and flat tyres! The Stanley j5c09 is the best jump starter with air compressor built in that we have found. If having an air compressor is important to you, please also check out the Clore JNC Air as it has an extremely high performing and well regarded air compressor. If an air compressor is not a feature you require, then the Clore JNC660 is definitely worth checking out. There are two metrics that impress with the JNC660, the peak amps and the customer satisfaction levels. The peak amps max out at 1700 amps, which is more than enough power for most uses and will even start V8 engines. The customer satisfaction level for this jump starter is over 90%, an impressive level of positive feedback for any product. You can sort the data by the required metric, just click on the column header. For example you can sort jump starter by peak starting power to order by the most powerful jump starter if you wish! A built in voltmeter gives instant feedback on the charge status of the jump starter. This is like an early warning system giving you a reminder that it’s time to give the jump starter a charge so that it is ready to perform when required. 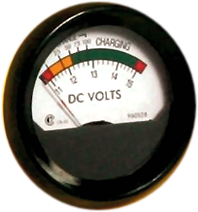 The voltmeter shown here is from the Clore JNC Air Jumpstarter. Because we all know that an emergency always occurs at the worst possible time, right? Some jump starters have a built in torch, which doubles as an emergency warning beacon to alert other drives to your stationary vehicle. 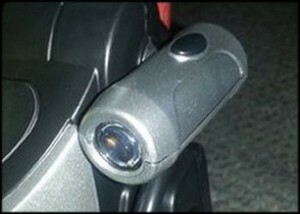 The torch shown above is from the Stanley J5C09 and is a high power LED with 270 degree rotation. Although all jump starters come with a long enough cable to safely connect to a car battery, it’s a consumers prerogative to always appreciate a slightly longer cable! With jump starters however the key metric with cables is not necessarily the length, but the gauge. The gauge of a cable is the thickness of the wiring, where the thicker the cable is, the lower the number is. Lower gauge jumper cables are more durable and efficient, but are also the most expensive! Thicker cables are more able to pass current to the vehicle, so remember, for a thicker cable capable of jump starting bigger batteries, you are looking for a lower gauge rating. For jump starting a car it would normal to see a gauge rating of 4-6. For more heavy duty applications a rating of 2 would be more suitable, this would be over specifying for normal motorist use however. 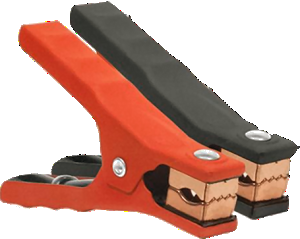 If you are looking for the very best clamps, that will perform the best and give you the very best chance of starting a stubborn flat battery, then you will want solid copper clamps. Solid copper is a great conductor, and the more power that a jump starter can pass to the battery terminal the more chance of your car starting. A cheaper alternative is a copper plated clamp, however over time the plating can wear off or become damaged, which reduces the conductivity and the efficiency of the jump starter.